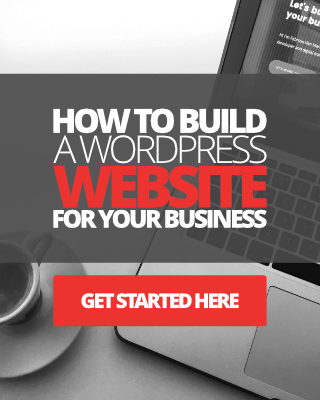 In this article, I’m going to share with you exactly what I experienced when migrating my WordPress website from Bluehost to SiteGround. If you’re thinking of moving host providers yourself, here’s how to do it. 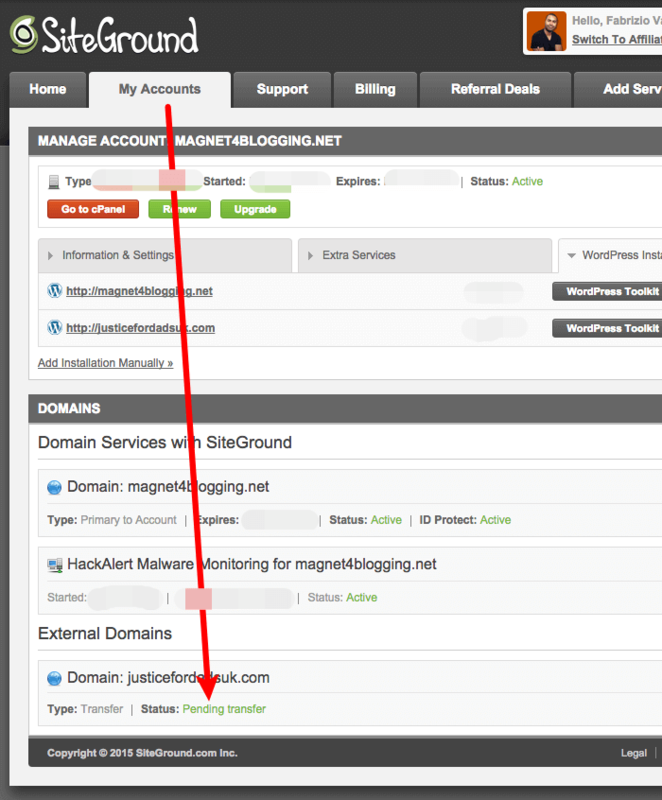 A while back I made the decision to change web host providers for this website, Magnet4Blogging Media. Beforehand, I had been with my previous hosting provider, Bluehost, for some time (Since 2010). Reason for changing? Well, I simply had enough of Bluehost’s depreciated level of service as a web host provider. I was experiencing way too many frequent downtimes that were costing my online business time and money. At one point, my website was down for 3 whole days with Bluehost. Not acceptable by today’s standard. So anyway, shortly after migrating Magnet4Blogging to SiteGround, I made the decision to migrate another website from Bluehost. So, what I thought would be really cool and useful for you is if I shared the exact steps that I took to make this move a successful one. Migrating Magnet4Blogging was a pretty smooth process, however, migrating my second website didn’t go quite as smooth. I’ll explain later on in the post why, however, it all worked out in the end. In May of 2015, after almost 5 years of being a loyal paying customer of Bluehost, I decided to leave for good. SiteGround actually got my attention when they left a sympathetic response to a complaint I made on social media about Bluehost’s service. OK, so to kick-start the process, the first thing that I did was log into my SiteGround web hosting account as normal. 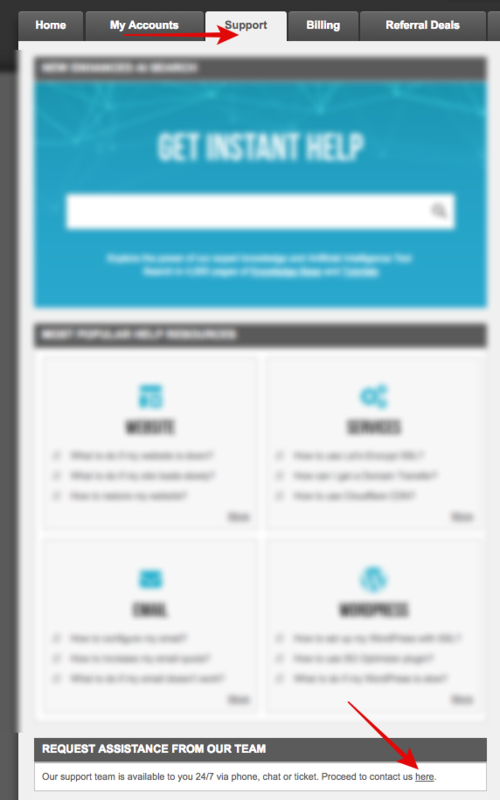 From the Home tab, I clicked on the Support tab and then scrolled down the page until I saw the message ‘Request assistance from our team’. I then clicked on the ‘Proceed to contact us here’ link to for more options, see image below. 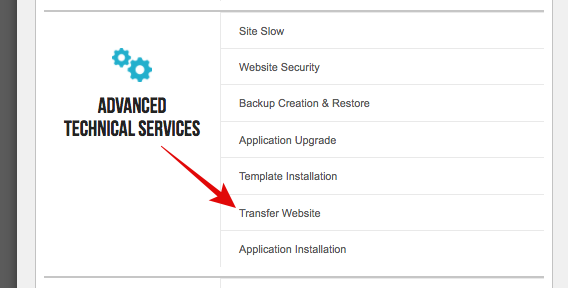 Under Advanced Technical Services, I simply clicked on the Transfer Website Link to get started. See image below. 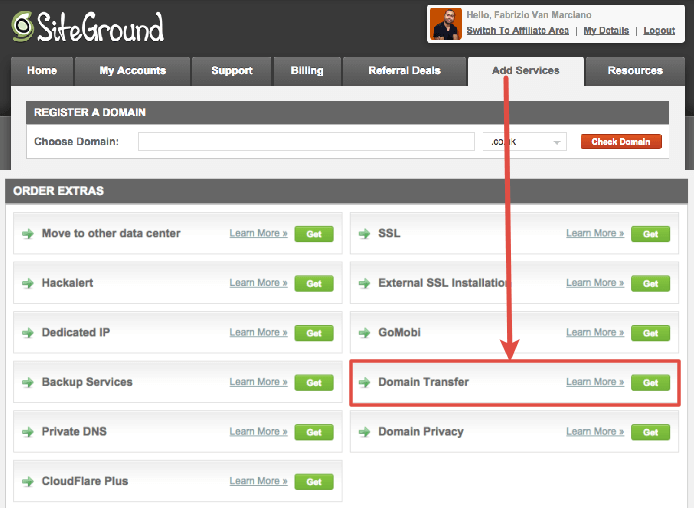 Just to make you fully aware that the website transfer service from SiteGround is a paid service. However, it’s completely free if you’re opening a brand new shared web hosting account with SiteGround for the first time, and, as long as your site is under 1GB in size. The regular transfer fee is $30 per website / cPanel at the time of updating this post (See last updated time stamp above). 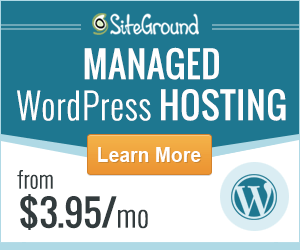 Need to start migrating your website to SiteGround? Click the button to get started. Once I filled the form and submitted it, I simply played the waiting game, which wasn’t very long at all. A few hours later, I got an email from one of SiteGround’s tech support staff to say the process was complete, wow, I thought, happy days, right? Nope… not happy days. Not yet anyway. The database I requested to have moved, for the website in question, was the wrong one. The SiteGround team had moved the wrong database to put it simply. I double checked phpMyAdmin to make sure that I wasn’t wrong about this, and to make sure I didn’t make a mistake requesting the wrong site to be moved, but everything checked out on my part. 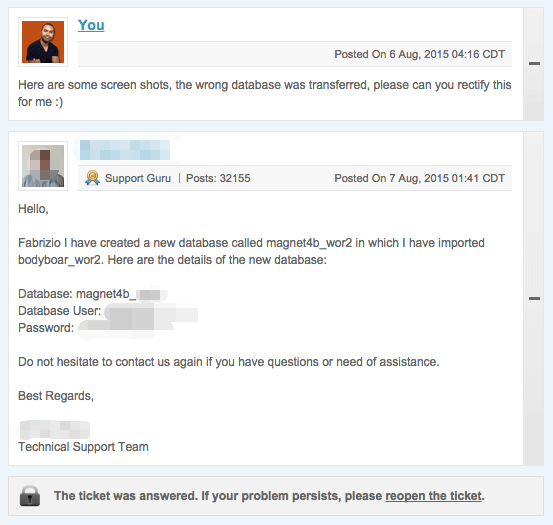 So, yep… there before my very eyes, was the wrong database transferred over. I quickly reopened the support ticket and responded to the last email I received from the SiteGround team. I told them that they had moved the wrong site for me. I clearly stated which database I wanted moving when I filled out the transfer form, the database name is bodyboar_wor2, instead, the database to another site that I didn’t want to use anymore was transferred over. I just want to state that I have very little technical knowledge or experience with hosting companies or indeed site migrations. 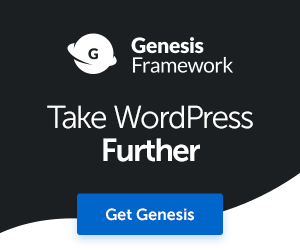 I’m still learning about this area, even though I’ve worked with WordPress for many years. …Fabrizio I have created a new database called Magnet44B_wor2 in which I have imported bodyboar_wor2… See below. So what’s the point in me sharing this small experience with you exactly? From a new customer signing up to a new web host provider, I was very happy and satisfied with the way SiteGround conducted themselves and treated me. They understood what I wanted to achieve, even though it took them a second attempt to get it right. That being said, nothing was too much trouble and they seemed very willing to help, so I was happy. 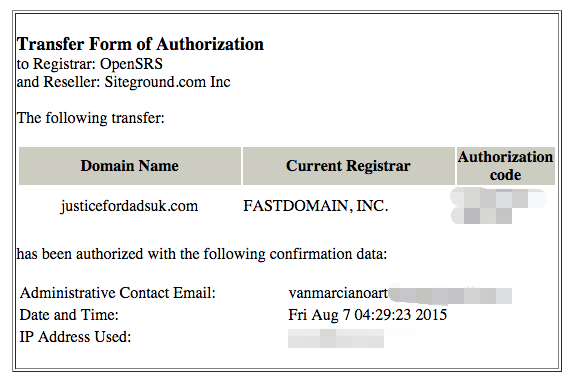 So, the next job for me was to migrate the domain name from Bluehost to SiteGround. 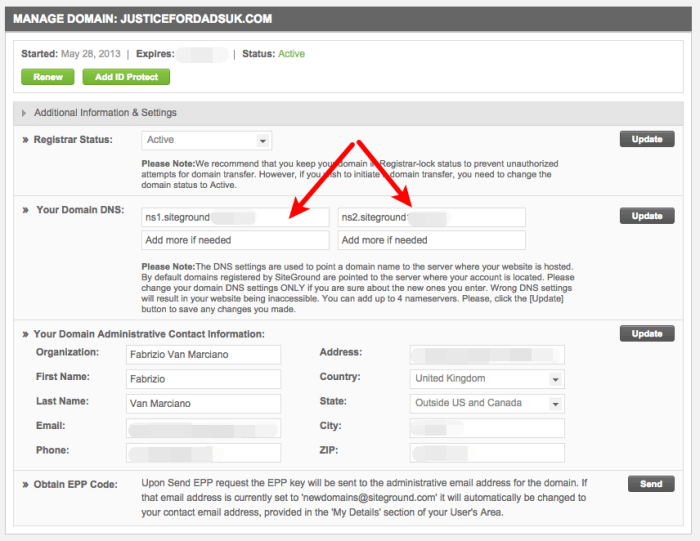 To migrate the domain name for the website SiteGround just transferred (JusticeForDadsUK.com), I first had to unlock the domain from my Bluehost account, see image below to see how I did this. After doing this, I then went back into my SiteGround hosting account and clicked on the Add Services tab, then scrolled down the page to Order Extras, then clicked on the Domain Transfer button. I filled in the domain transfer form, which was self-explanatory, but I’ll walk you through the process nevertheless. Here is a screen shot of the form below. Product Information – Here you simply enter the domain name you want to transfer and select any additional options. Domain Transfer Information Required – In this field you need to enter the EPP authorization code, and administrative email address. 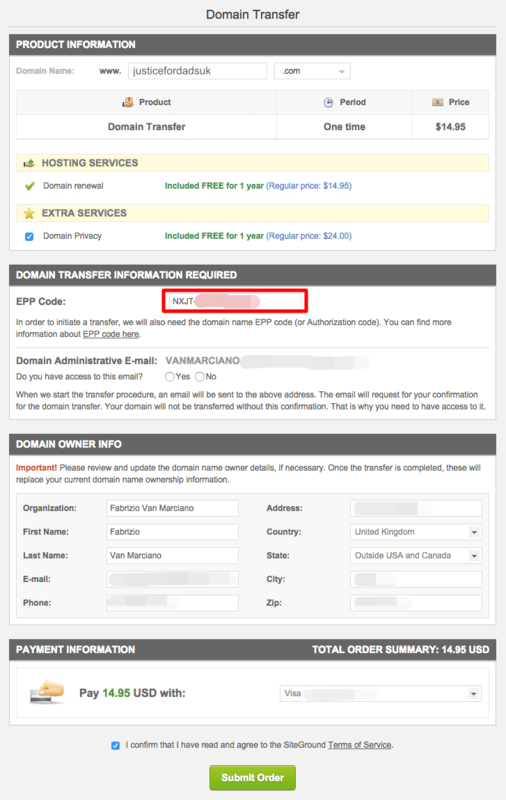 In Bluehost, you can find your EPP code under domains, then select the domain you’re transferring. In the domain information box, you’ll see a tab called transfer EPP, that’s where you will find your EPP code. Here’s a screenshot of what mine looked like. Domain Owner Info – This is where you place domain owner information such as name and address, email, phone, and country. It’s important you keep this information up to date at all times. OK, so for me, once I was done filling all the fields on this page, I simply confirmed the terms and hit ‘Submit Order’ with my payment details. If you’re doing this for the very first time by yourself, the process isn’t over yet. You will be sent an email from SiteGround to authorize the domain transfer. When you receive this email, open it and click on the approve transfer link within this email. A page will load in your web browser and you will need to enter your EPP code again, and simply agree to the terms of the transfer. 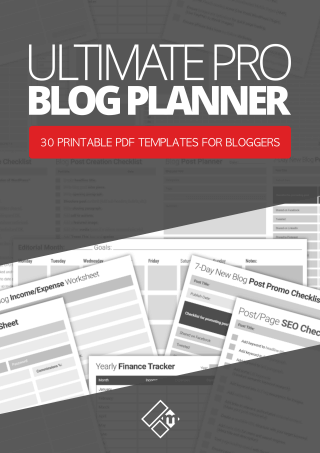 I’d highly recommend saving the page or printing it for later reference should you need it. 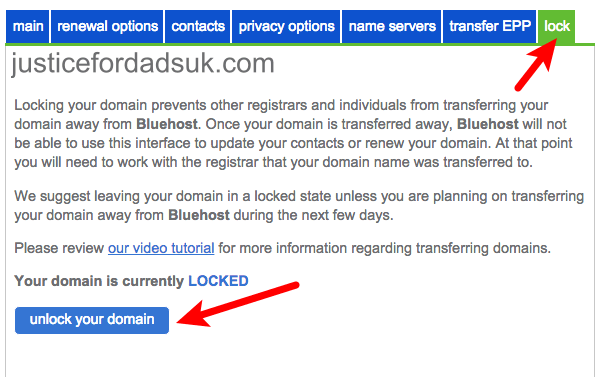 Additionally, you will need to go back into your Bluehost domain info page to confirm the transfer there too. The process is complete, transfer usually takes 7 days, but I’ve found this to happen much sooner. If you log into your SiteGround account and go to My Account, under Domains you should see that the domain transfer is pending. See image below. One last thing I want to mention quickly is that you will probably need to change your domain DNS, as it will still be pointing to the Bluehost server your site was hosted on still. If you didn’t move your site (as shown at the start of this post), and you only moved the domain name, then leave this well alone. OK, so that’s my little experience with migrating my WordPress website from Bluehost to SiteGround. I now have both my personal brand business website and my niche blog proudly hosted with SiteGround. Asides from the small time-consuming error SiteGround made with moving the wrong database (website), the outcome was a positive one in the end. Whilst they never really admitted that they made an error, or even apologized for the inconvenience it may have caused, they did rectify the problem for me reasonably quickly, so like I said, happy days. I hope that you found this post useful in some small way. The best of luck with your website migration. Do I recommend SiteGround? Yes.